Canyon Creek Pool, a pool/bathhouse facility, is the centerpiece for the Canyon Creek Community Park. The 1,700 square foot project consolidates bathhouse functions, public gathering space and general park support into a single central location. 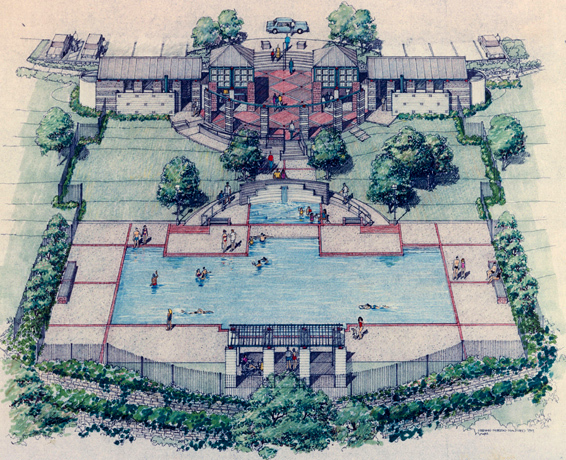 Located on a prominent, sparsely wooded slope, the central architectural elements (plaza, fountain wall, and shade structure) are layered on terraces along an axis in order to lend a visual unity to the pool area. The poolhouse building consists of two mirror-image structures nearly bisecting a circular central plaza. The long, gable-roofed bathhouses with lantern-topped pavilions flank the pool area entrance and contain the changing/shower rooms, the park office and a community space. In addition, the pavilions provide evening illumination for the plaza and a visual focus for the community and park.